Precious Bones by Mika Ashley-Hollinger. 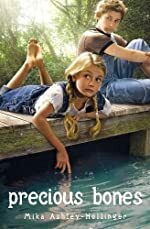 Review: Fights, southern hospitality, and friendship all describe the book Precious Bones written by Mika Ashley-Hollinger. Precious Bones' main character, Bones, lives in a small town during the summer of '49. Come follow Bones' journey as she goes through love, family, friendship, and most of all heartbreak. We would like to thank Raab Associates for providing a copy of Precious Bones for this review. Have you read Precious Bones? How would you rate it?